At the time I am writing this text, messages on this site are coming every second or two. Is not it amazing? Thanks a lot to creators of Stack Exchange, Stack Overflow, Super User, AskUbuntu and others. Thank you so much elder and young people for your participation, helping answers and important questions. I have been working as a software engineer since 2000. It is mostly embedded application developing. I often write or modify/port device drivers. All projects I was involved in I worked at low level programming with deep digging to a hardware specification. I managed with inner mechanisms of a number of RTOSes. I started using Linux with Ubuntu 06.10 Edgy Eft, then I tried to get used to OpenSuse, Fedora and Debian. Ubuntu is the OS of choice for me now. It is my previous computer at the picture, has been serving me for ten (10!) 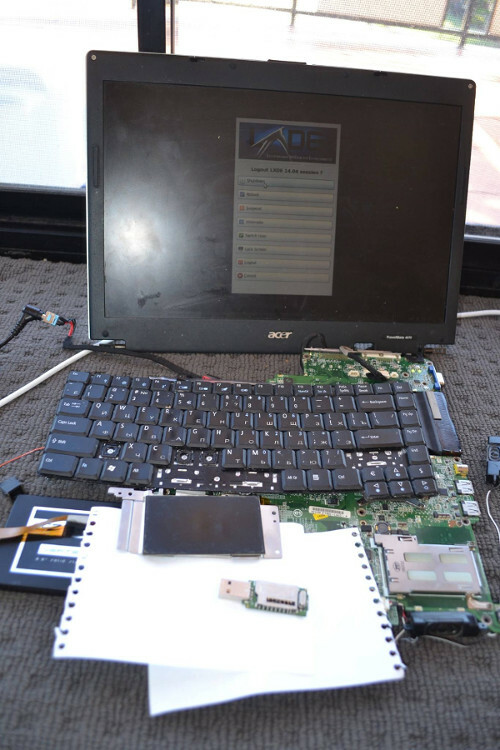 years, Acer TravelMate, Intel Core Duo 2GHz 2Gb, at the picture is with SSD (replaced the broken original HDD two years ago). It was not disassembled until yesterday. Now unscrewed to the last bolt in order to find elusive and invisible "floating" contact, actually to fix the hanging state, freezing, which may appear many times a day. Working with the unscrewed and wobbly laptop, of course, is more inconvenient - at least need to hold freed touch-pad and keyboard, but there is an illusion that elusive and invisible "floating" contact knows I am keeping my eye on it and fears to be placed into the rubbish bin. It was my first laptop. It did not pass even two days as I bought a new machine. It is Dell Latitude E6410 for now. 17 Does the phrase "не за что!" have two meanings? 16 напугал кота сосиской - Is it an idiom? 11 Is Little-Endian a byte or bit order in x86 architecture? 10 If a motherboard doesn't explicitly support a RAM frequency, is still compatible?